Did you know the normal body temperature for animals is higher than for human. For example the normal temperature for a cat is 100 to 102.5 degrees. The temperature gradually increase to 100 degree at the age of 4 weeks. The snoozer cat beds are ideal for your kitty. With a dual thermostat 4 watt heating unit built in it warms the surface of a cat bed to a pleasing 102 degrees which the cat loves. 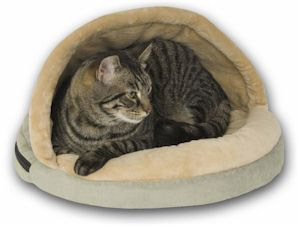 The snoozer thermo-kitty hut is the ideal cat bed for your feline friend that matches the need 102 degrees that makes your cat very happy while sleeping.